Maren graduated from the University of North Dakota School of Medicine and Health Sciences in Grand Forks, ND with a Doctor of Physical Therapy. 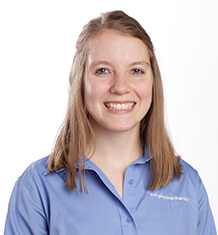 She joined MTI Physical Therapy in the Fall of 2014, although she completed the clinical portion of her education at MTI’s Kirkland clinic. Her background includes experience in outpatient orthopedics with emphasis on manual therapy and exercise rehabilitation, as well as outpatient neurologic rehabilitation (spinal cord injury, stroke, and amputations) including experience in mobility assessment and aquatic therapy. She completed further training in manual therapy through the Ola Grimsby Institute’s (OGI) Orthopaedic Manual Therapy residency and fellowship programs. Having moved to Washington from South Dakota, Maren enjoys all the activities that the Pacific Northwest has to offer. She enjoys staying active playing sports including volleyball and running and loves helping patients stay active and fit. In her free time, she coaches volleyball at Woodinville High School and for the Falcon Volleyball Club. She also is a big football, hockey, and baseball fan. Maren has a passion for community service and enjoys organizing and participating in events to give back to the community.